A structured cabling system is a set of cabling and connectivity products that integrates the voice, data, video and various management system of the building such as CCTV Cameras, Access Control & Security Access, Safety Alarms, Energy Systems, etc. It provides a platform upon which an overall information system strategy is built. An inferior structured cabling system can cause up to 70% of network downtime. Low Voltage Cabling: Solutions that complies Paging Systems and Music. This is why we help you upgrade your network for better connectivity at an affordable cost and get a robust cabling infrastructure to support your ever-increasing bandwidth usage. Working closely with the world’s leading providers of end-to-end connectivity solutions, we offer you structured cabling services that are solid, adhere to stringent quality controls and surpass industry standards. We provides an ‘end to end’ service from design to implementation. We design and build cabling infrastructure systems that support multiple voice, data, video and multimedia systems. We will help you evaluate, design and install the optimum integrated system for your company. 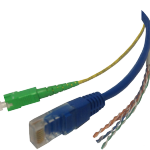 We provide infrastructure cabling of the highest quality. We have the resources to carry out intricate installations of extra low voltage cabling for applications involving Fiber Optics, Telephony, Data, Building Automation, CCTV/SACS, Fire Alarm, Lighting controls and much more. Our cabling team has the experience to handle all communication devices and applications, such as voice, data, and video. Every project is overseen by a supervisor who will ensure that the installation is carried out as designed and is completed on time ensuring that vital changes are tracked and documented along the way thus adhering to the highest industry standards.